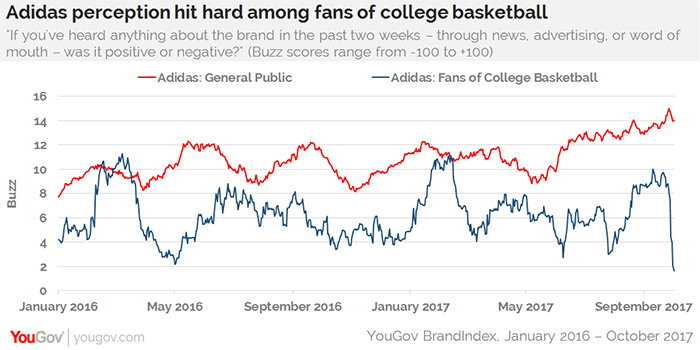 While the general public seems largely unfazed in its perception of Adidas’ integral role in the unfolding NCAA payoff scandal, college basketball fans feel quite negative, according to YouGov BrandIndex. Indeed, the difference in reaction between the two groups of consumers is quite stark. YouGov BrandIndex measured consumer perception using its Buzz score, which asks respondents "If you've heard anything about the brand in the past two weeks – through news, advertising, or word of mouth – was it positive or negative?" A score can range from -100 to 100 with a zero score equaling a neutral position. Adidas reached its highest Buzz score in four years among the general population at the very end of September, with only a miniscule drop-off since then. On the other hand, college basketball fans sent Adidas’ Buzz score sharply downward to its lowest point since spring 2016, when the apparel brand released its Yeezy Boost sneakers and a German court rejected its attempt to prevent Puma from launching a new shoe line. Currently, Adidas’ Buzz score drop of seven points with college basketball fans in one week is moving at a faster pace than last spring’s descent. Yet, at its current score of 2, Adidas is still not in negative numbers, which would mean more negative feedback than positive.